Greenlandic cultures rely on both sea ice and inland ice for food security, travel, and is central to Greenlandic Indigenous traditions. Ice melt and lack of summer sea ice will also constitute the loss of Indigenous cultures who have relied on the ice for thousands of years. Greenland has lost an average of 375 gigatons of ice per year from 2011-2014 which was nearly doubled from 2003-2008 (SWIPA 2017). The melting ice is currently affecting Arctic ecosystems including changing the range of Arctic species, migration patterns, frequency of wildfires, rain-on-snow and winter thaw/refreezing events which affects grazing animals such as caribou, reindeer, and muskox by covering lichen and mosses in ice (SWIPA 2017). Ice melt is a particularly important issue to address as many Greenlanders rely on hunting and fishing as part of their daily nutrition and food stability (Nuttall 2017). It is also crucial to recognize that Indigenous people in the Arctic have been adapting to changing weather and rapid climate change for many years and have extensive knowledge from centuries of living as a part of the landscape. However, with temperatures increasing every year and more old land ice melting there may come a threshold in upcoming years where there is no summer ice and limited old land ice which will affect marine ecosystems, terrestrial ecosystems, and human cultures (SWIPA 2017). The estimated economic cost of Arctic climate change is USD $7-90 trillions over the period 2010-2100 (SWIPA 2017). The implications of the loss of ice are omnipresent and worsening and the Arctic is especially vulnerable. It is imperative that the voices of Indigenous Arctic people be heard when considering a future without ice and the world must consider the people of the Arctic losing ice cover and not place all focus on how ice melt will affect the rest of the world’s climate. Rising temperature and the resulting permafrost thaw and other changing precipitation patterns are likely to affect Greenlandic infrastructure such as Arctic cities, rural settlements, residential buildings, roads and air strips, and storage facilities for hazardous waste (Larsen et al., 2017). Climate change is impacting freshwater and terrestrial ecosystems in the arctic resulting from permafrost thaw and extent of ice cover which creates environmental concerns as well as food security issues for Greenlandic people (Larsen et al., 2017). The impacts of climate change in regions like the Arctic compound existing physical, biological, and socioeconomic vulnerabilities (Larsen et al., 2017). Climate change is expected to have major effects on Arctic communities especially on smaller, subsistence-based economies because changing sea ice conditions make fishing and hunting marine mammals more difficult, though some commercial activities will become more profitable (Larsen et al., 2017). Some likely impacts include extreme weather events, rapidly changing weather conditions, and increasingly unsafe hunting conditions, and temperature-related stress (Larsen et al., 2017). Unsafe hunting conditions due to thin and/or slushy ice include physical and mental injuries, death, and disease. Additionally, with rapid snowmelt and intense precipitation events there will be increased rock falls, debris flow, and avalanches. These could potentially cause direct physical harm or limit travel which risks people being trapped outside of their own communities and limit access to vital supplies and services (Larsen et al., 2017). The stress of the loss of traditional cultures and methods are documented to be significant psychological and mental burdens among residents (Larsen et al., 2017). Greenland has an extremely high and increasing suicide rate especially among Indigenous youth which is thought to be partially exacerbated by climate-related impacts (Larsen et al., 2017). Kangerlussuaq is located on the western side of Greenland at the end of a 190 km long fjord. Kangerlussuaq is also a unique location because it is the only Greenland where the Greenland Ice Sheet is accessible via road. However, access to Russell Glacier is becoming more difficult because this glacier where the ice sheet is accessed has been melting rapidly which presents hazards to those on and around the ice sheet including floods, debris flow, and damage to infrastructure (Carrivick et al., 2017). Studies have found that glacier outburst floods— like those possible and increasingly likely from Russell Glacier as climate change worsens—have a 36% rate of having societal impacts including over 12,000 deaths globally (Carrivick et al., 2016). It is feasible that most of the ice caps south of Kangerlussuaq fjord will be gone by the end of this century (Boberg et al., 2018). 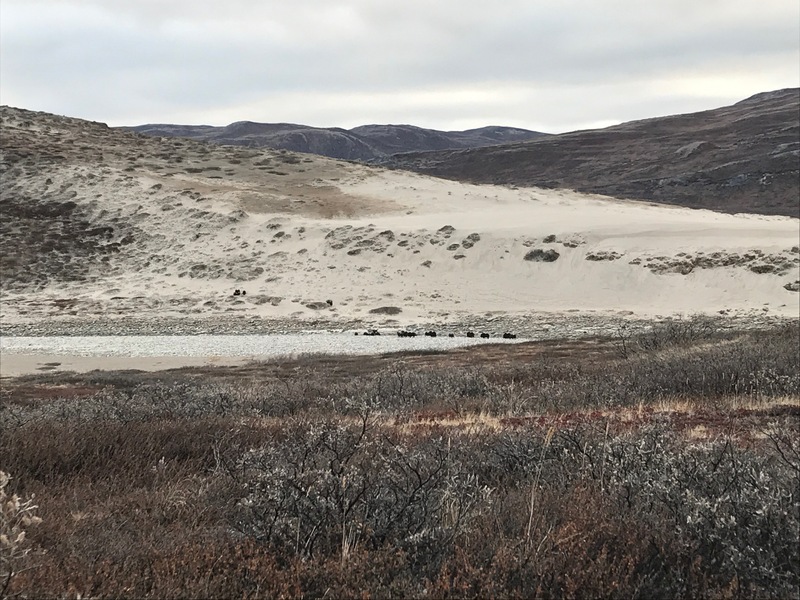 Ice melt will have significant effects on the Kangerlussuaq settlement especially on river catchments such as the Watson river which flows through the settlement. Increased river flow can have impacts on infrastructure and higher meltwater into the fjord has potential to have an effect on fisheries (Boberg et al., 2018). Additional health exposures include increasing levels of heavy metals in the nearby fjord and other water contamination (Konrig et al., 2016). Above average levels of cadmium and lead have been observed in the fjord likely from the airport (Knorig et al., 2016). Wastewater treatment is also poses an exposure risk to Kangerlussuaq residents as conventional wastewater treatment is not present in the region and wastewater is discharged into local waterbodies without treatment (Konrig et al., 2016). 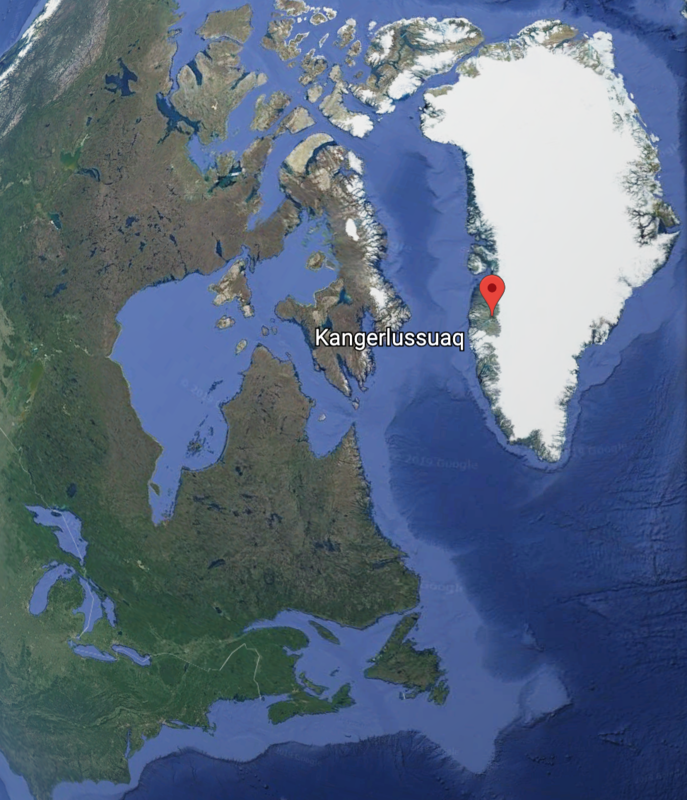 Kangerlussuaq is one of the more studied locations in Greenland because of its accessibility by air thus enabling more extensive predictions about what the future entails. High-emissions scenario leaves Kangerlussuaq and other parts of Western Greenland with significant effects especially regarding river and fjord flooding (Boberg et al., 2018). The high-emissions scenario requires attentive planning regarding current and future infrastructure (Boberg et al., 2018). Effects of climate change will initially impact local glaciers which are likely to disappear within the end of the century under RCP 8.5. Increased flooding washed out the Watson River Bridge in Kangerlussuaq in 2012 and separated the town into two parts with no way to get to one another by car (Mikkelsen et al., 2016). The bridge has since been rebuilt but reiterates the importance and imminence of climate change to this location. Studies and climate models also suggest an increase in melt-water runoff and temperature in recent years (van As., et all 2018). Warming temperatures equate a loss of traditional hunting and the possibility of adaptation to farming (Sejersen 2015). It is essential to listen, understand, and act on Indigenous knowledge and what residents of Greenland and other vulnerable communities identify as climate change related concerns (Ford et al., 2015). Mylea Mann is an English and Environmental Combined major graduating from St. Lawrence University in 2019. 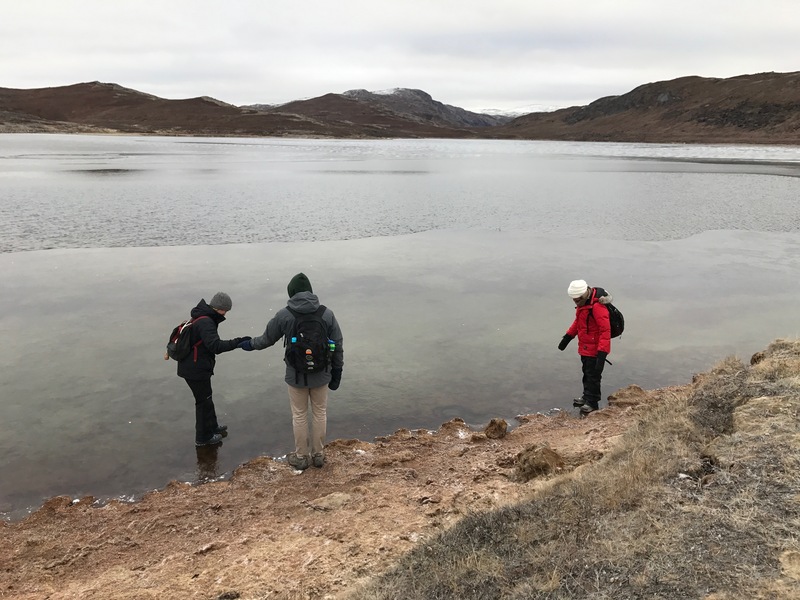 Mylea visited Kangerlussuaq, Greenland in October 2017 while studying abroad in Denmark. 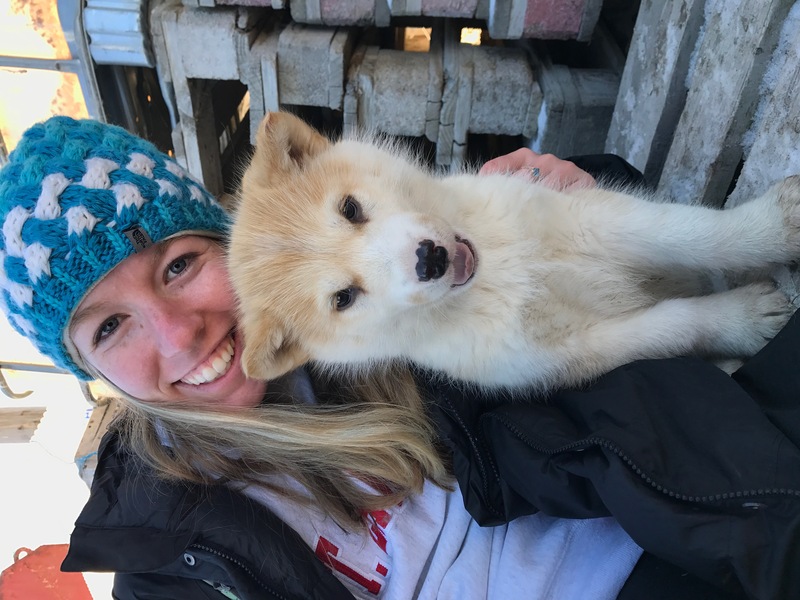 In Greenland, Mylea hiked on the ice sheet, saw the Aurora Borealis, played with sled dog puppies (see photo), met with local families, and fell in love with Greenland. Mylea is spending her summer hiking Yellowstone National Park as a leader for Overland Summers. Her dream is to return to Greenland while there is still ice and to contribute to reversing climate change. Boberg, F., Langen, P. L., Mottram, R. H., Christensen, J. H., & Olesen, M. (2018). 21st-century climate change around Kangerlussuaq, west Greenland: From the ice sheet to the shores of Davis Strait. Arctic, Antarctic, and Alpine Research, 50(1). Carrivick, J. L., & Tweed, F. S. (2016). A global assessment of the societal impacts of glacier outburst floods. Global and Planetary Change, 144, 1-16. Carrivick, J. L., Tweed, F. S., Ng, F., Quincey, D. J., Mallalieu, J., Ingeman-Nielsen, T., ... &Russell, A. J. (2017). Ice-dammed lake drainage evolution at Russell Glacier, West Greenland. Frontiers in Earth Science, 5(100). Ford, J. D., McDowell, G., & Pearce, T. (2015). The adaptation challenge in the Arctic. Nature Climate Change, 5(12), 1046. Larsen, J.N., O.A. Anisimov, A. Constable, A.B. Hollowed, N. Maynard, P. Prestrud, T.D. Prowse, and J.M.R. Stone. (2014). Polar regions. In: Climate Change 2014: Impacts, Adaptation, and Vulnerability. Part B: Regional Aspects. 1567-1612. Mikkelsen, A. B., Hubbard, A., MacFerrin, M., Box, J. E., Doyle, S. H., Fitzpatrick, A., Hasholt, B., Bailey, H. L., Lindbäck, K., and Pettersson, R.: Extraordinary runoff from the Greenland ice sheet in 2012 amplified by hypsometry and depleted firn retention, The Cryosphere, 10, 1147-1159. Sejersen, F. (2015). Rethinking Greenland and the arctic in the era of climate change: new northern horizons. Routledge. Snow, Water, Ice and Permafrost in the Arctic (SWIPA). (2017). Summary For Policy Makers. Van As, Dirk., Bent Hasholt, Andreas P. Ahlstrøm, Jason E. Box, John Cappelen, William Colgan, Robert S. Fausto, Sebastian H. Mernild, Andreas Bech Mikkelsen, Brice P.Y. 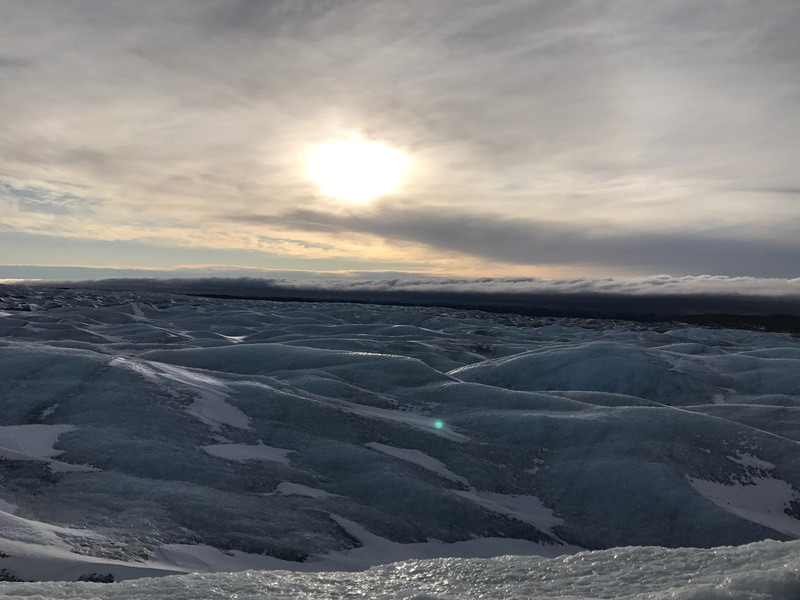 Noël, Dorthe Petersen & Michiel R. van den Broeke (2018) Reconstructing Greenland Ice Sheet meltwater discharge through the Watson River (1949–2017), Arctic, Antarctic, and Alpine Research, 50:1. Yde, J. C., Anderson, N. J., Post, E., Saros, J. E., & Telling, J. (2018). Environmental change and impacts in the Kangerlussuaq area, west Greenland.